Christmas is two days away so you have plenty of time to make my Mom's Pumpkin Pie. I was back in Gonzales, Louisiana around Thanksgiving and got her to cook it on camera. Boy, was it good -- so good that a lot of my Cajun cousins swung by. It was a fun and noisy day, as you will see, where everyone lines up for a slice after the pies cool down. Mom made a wheat crust from scratch, but for the filling she went with the convenience of canned pumpkin. 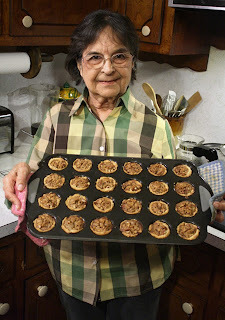 I know you are disappointed that we didn't find a free pumpkin in the wild, like we did a couple of weeks ago on Mom's last dessert recipe of Mini Pecan Pies -- where we went pecan picking out in a field of pecan trees (click here for that video). Even with canned pumpkin, Mom's extra ingredients of spices, eggs and evaporated milk, make a luscious filling with a creamy flavored kick of cinnamon, ginger, vanilla and clove. 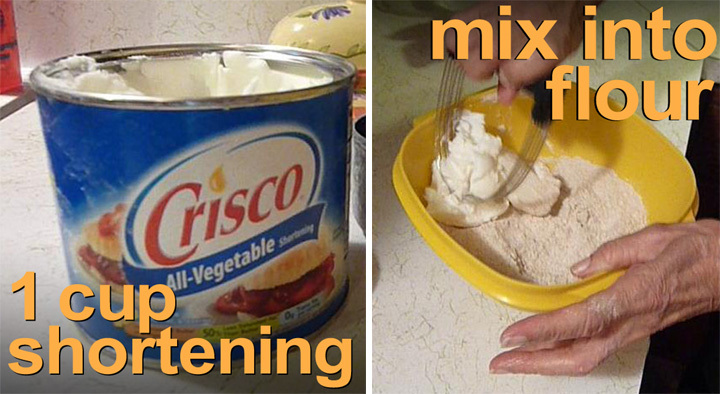 The rest of the pie filling was made with cheap ingredients. 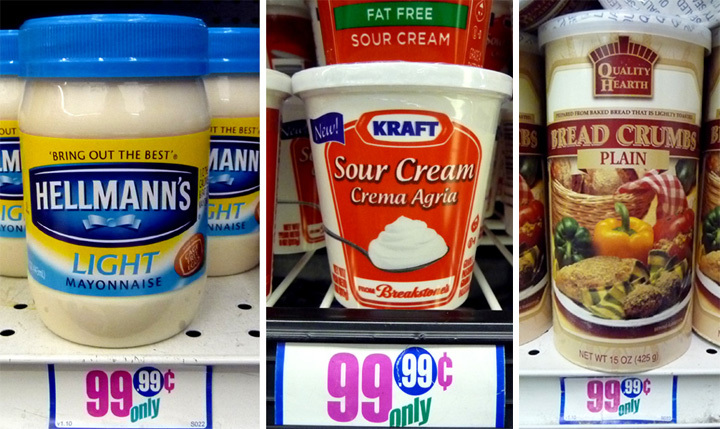 This week I went searching for a cheap can of pumpkin and found out how expensive it is. Almost $3 a can! 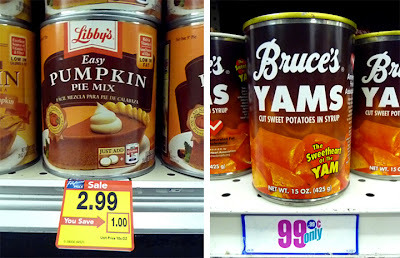 Now, for this recipe I am following Mom's lead, and would not have her change a family recipe handed down to her, but I can offer a 99.99 cent substitution: canned sweet yams. They are almost the same color, and by the time you add sugar and all the spices to Mom's pumpkin filling, it almost tastes the same. I've had Sweet Potato Pie (probably made with canned yams or sweet potatoes) at my local Soul Food restaurant and it's dang good. The consistency is similar to pumpkin and the flavor is sweeter. 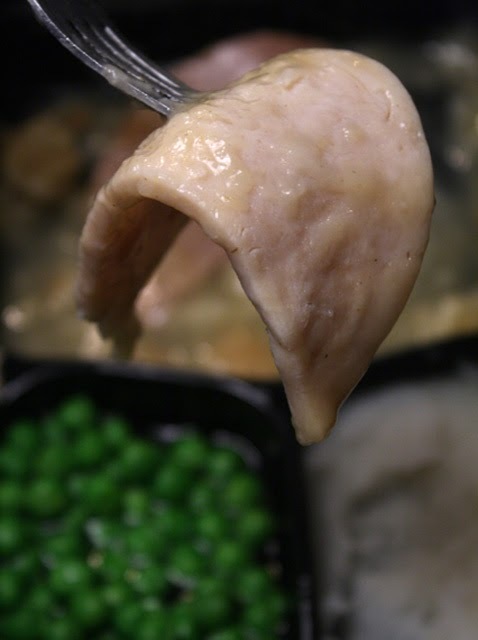 Usually canned yams are cooked chunks floating in liquid. So if you want to make a cheaper pie using yams, you should drain the can and mash the cooked yam flesh. And, I would use half the sugar that Mom uses for her Pumpkin Pie. The best substitution would be to fork mash the orange flesh of fresh baked and peeled sweet potatoes -- they are almost as cheap as russet potatoes. See, dear reader, I am always thinking of you, and how to make a cheaper, but still tasty twist on a typical expensive dessert! 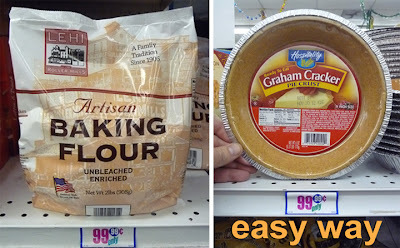 You could also buy an inexpensive pre-made pie crust -- but if you have time, do give Mom's homemade version a try. The whole pie came together quickly and easily. 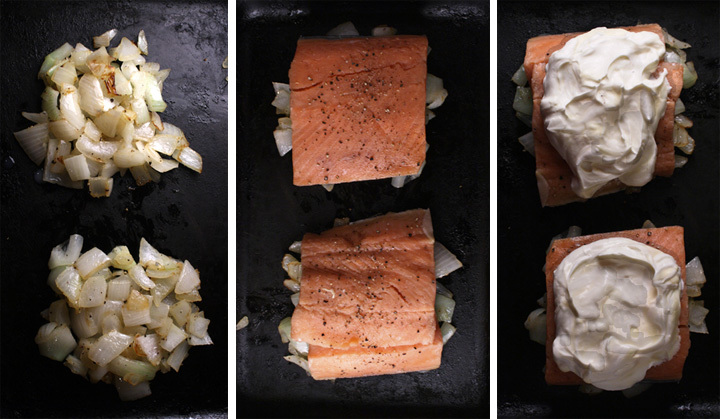 It's a two-for-one recipe. 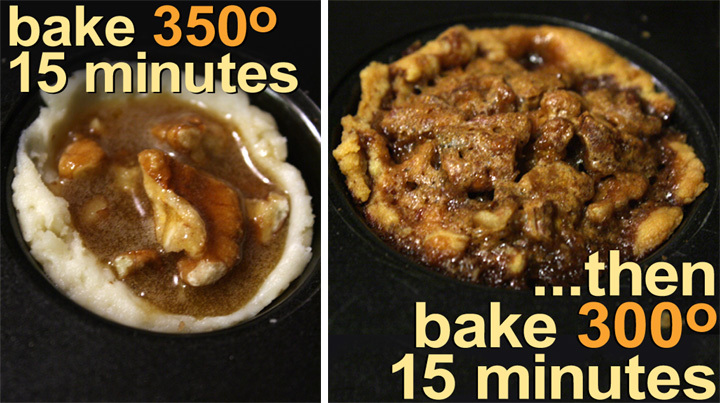 The video recipe is for 2 pies. 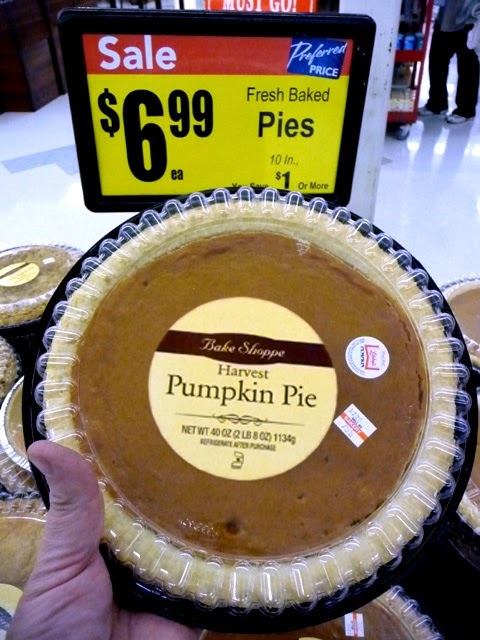 Of course, it's easy to cut the ingredient amounts in half to bake one pie. 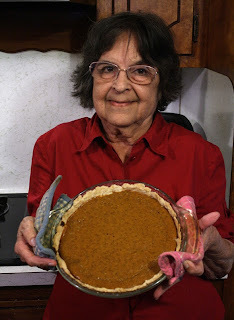 I have to give a big 99 thanks to all my Cajun relatives -- I didn't have to twist their arms to give Mom's Pumpkin Pie a try -- and an extra 99 thanks to Mom for sharing her recipe with all my readers. And Merry Holidays to all! See you again in the new year. Play it here. Video runs 8 minutes, 53 seconds. Add flour and salt to a large bowl for mixing. 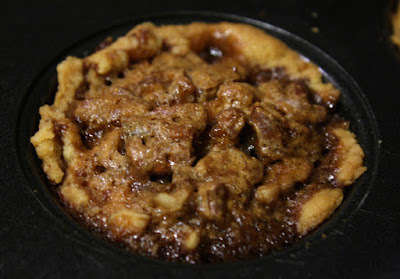 Scoop in a cup of shortening. Mix in with a fork until flour becomes pea sized lumps. Pour in a cup of cold water. Now you have to get your hands dirty. 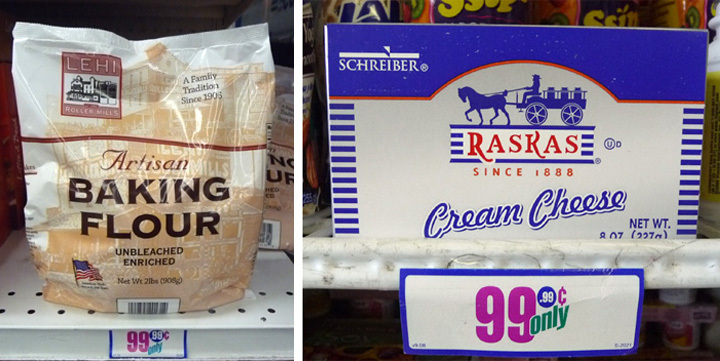 Mix the dough by hand for about 3 minutes until it all comes together. Sprinkle flour over a work surface. 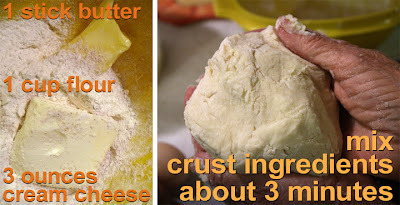 Plop dough on it and form into a ball. Divide the ball in half. With a rolling pin, roll out each dough ball until it is large enough to fit over your baking pie pan. Press dough into the pan and press together any cracks that split during the transfer. 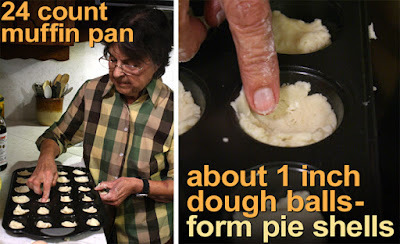 You can pinch dough ridges around the top if you want to. 2 cups of canned pumpkin - okay to use cheaper canned sweet potatoes or yams (drain then mash with a fork or potato masher to smooth. 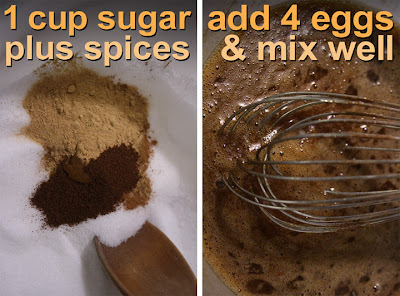 1 cup of sugar - use half a cup if you are using sweet potatoes or yams. Of course, best to use baked and peeled fresh orange colored yams - about 2-4, depending on the size. 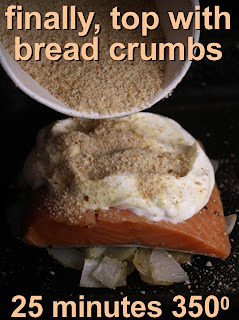 In a large bowl mix in dry ingredients and spices including: sugar, salt, ground cinnamon, cloves and ginger. In another small bowl, add 4 eggs and lightly whisk the egg yolks and whites together for a minute. 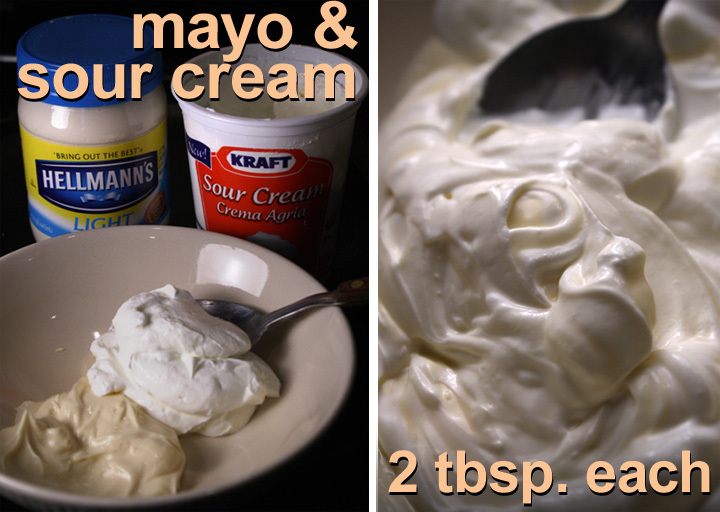 Pour blended eggs into the bowl of dry ingredients. Mix it all together for a minute. Spoon in 2 cups of canned pumpkin into the spices and egg mixture. Next pour in 2 cups of evaporated milk. Whisk it all together for a minute or two until well blended. 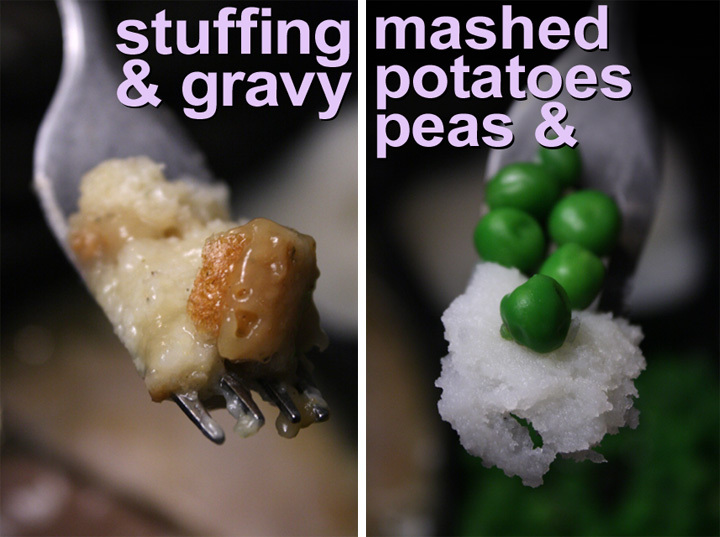 Okay to substitute cheaper sweet potatoes or yams, but first drain and mash with a fork or potato masher. They"re usually canned in liquid with large pieces. Now it all comes together. 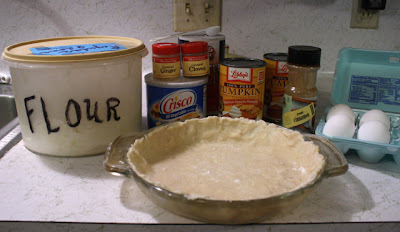 Just pour the pie filling into both pie shells until pie shells are almost full. Add pies to a 425 degree heated oven for 15 minutes. Then reduce heat to 350 degrees and finish baking for 40 minutes. Mom uses a toothpick test to see if a pie is cooked through. 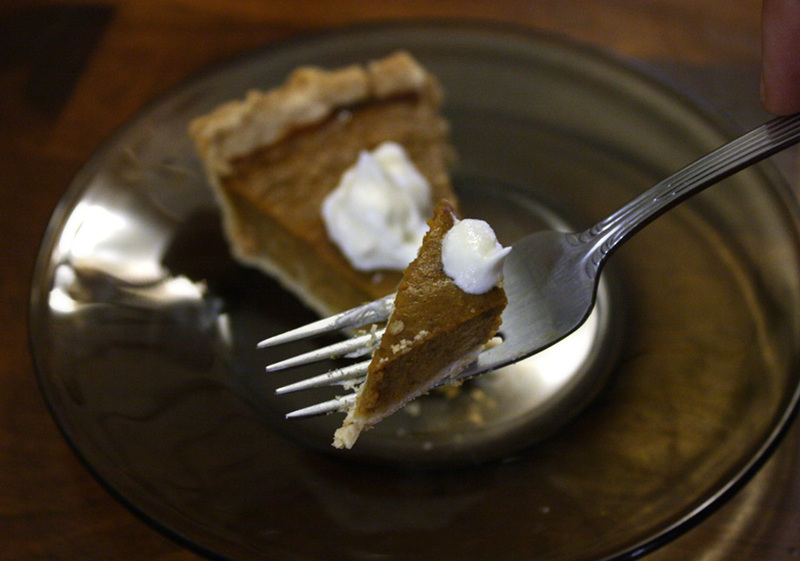 She inserts a toothpick into the center of the pie, then removes the pick to see if it's wet. If it comes out clean, it's ready. If it is still wet, she puts it back in the oven for another 5 - 10 minutes. I think if the toothpick is slightly damp, you can just leave the pie out to cool, as it will continue cooking anyway. Of course, you could easily half all the ingredients to make just one pie. You can also speed up the cooling by putting the pies in the refrigerator. 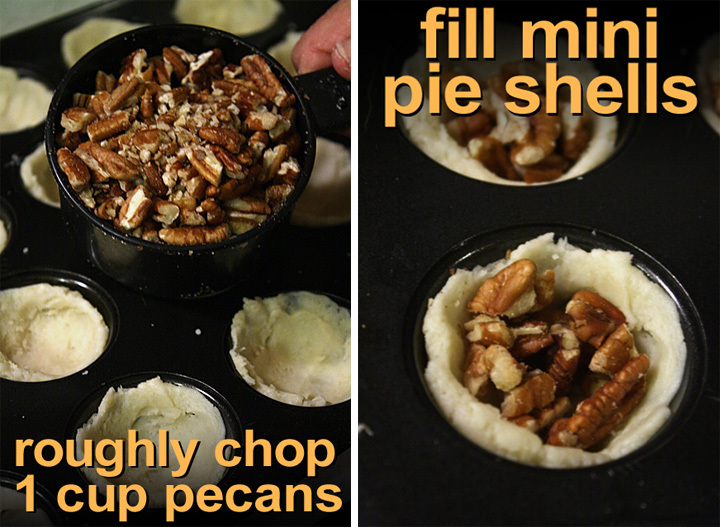 Since the pie plates are hot, you need to allow them to cool for 10 minutes first. 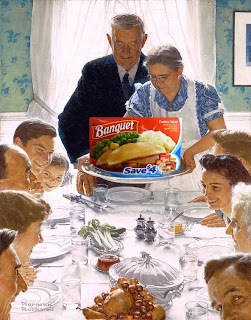 Then place potholders, or a kitchen towel, on the refrigerator surface and place the pies on it. Pies store well in the refrigerator, so you can make them a couple of days beforehand -- just cover with plastic wrap after they cool down. Pie slices are delicious on their own, but you may want to top with whipped cream. Of course, you can just buy a premade crust at the market for cheap. I thought it fun to show how Mom makes hers. 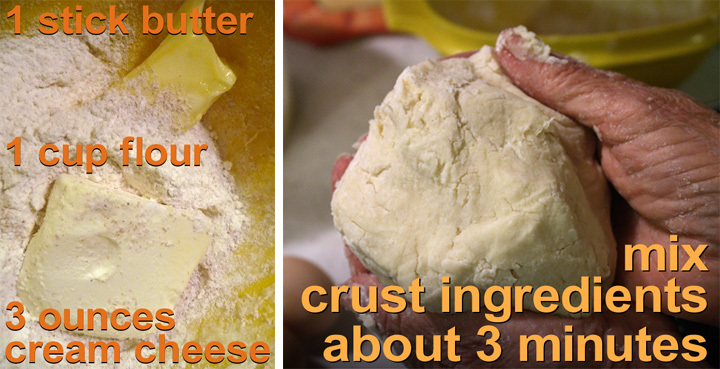 As mentioned earlier, it is easy to cut the ingredients in half to make just one pie. 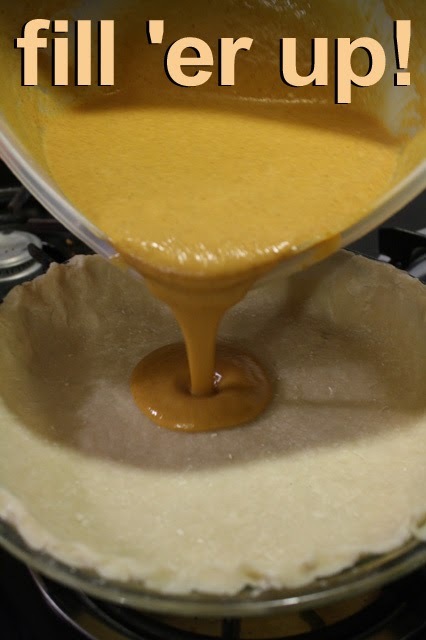 You could shave off 10 minutes or so for a creamier pudding like filling, that's still enough time to cook the crust. 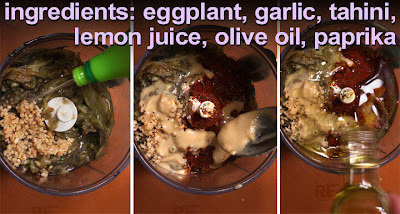 Get out the low sodium, glutten-free, baked, organic, mulit-grain crackers for this video recipe of delicious dip: Baba Ganoush. 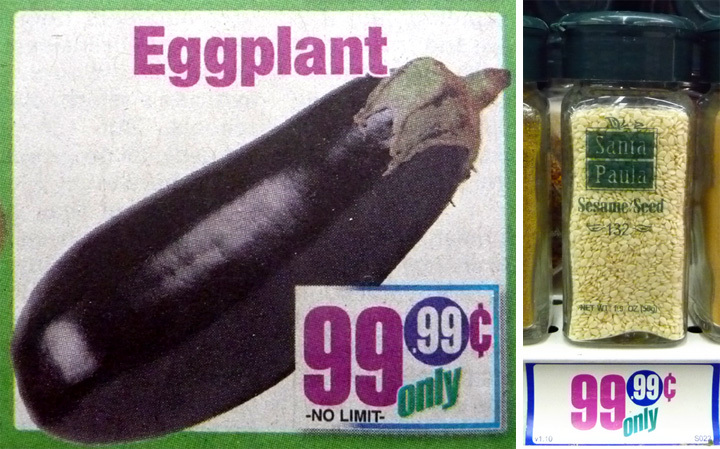 And, an Eggplant just looks funny: a black/purple, oddly shaped, inflated veggie balloon (and, it's as light as one, too.) But, boy does it taste good in The 99 Cent Chef's latest recipe video. 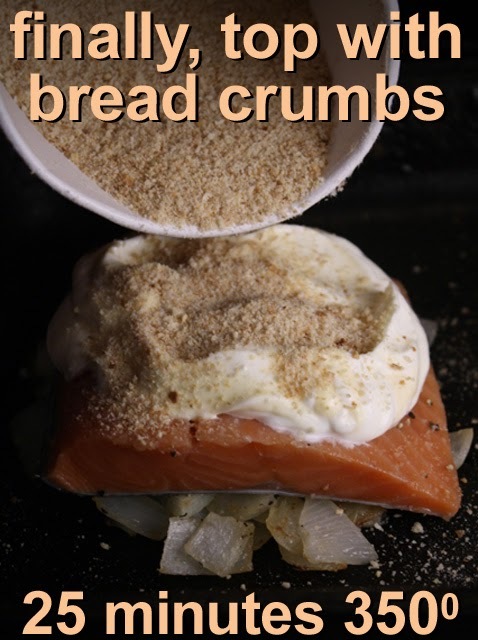 The other ingredients are cheap enough: sesame seeds, olive oil, chopped garlic, lemon juice, and a couple of optional ingredients: ground paprika and parsley. 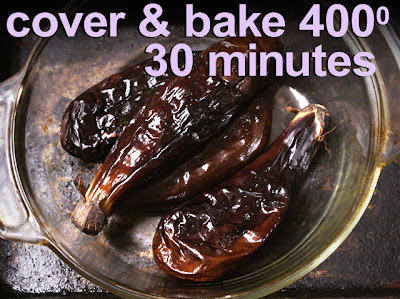 Eggplant, like a whoopie cushion, deflates into a soft mass after it's baked in the oven for half an hour. 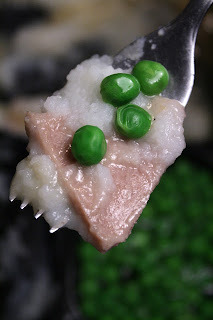 While the skin is bitter, the mushy flesh is sweet. 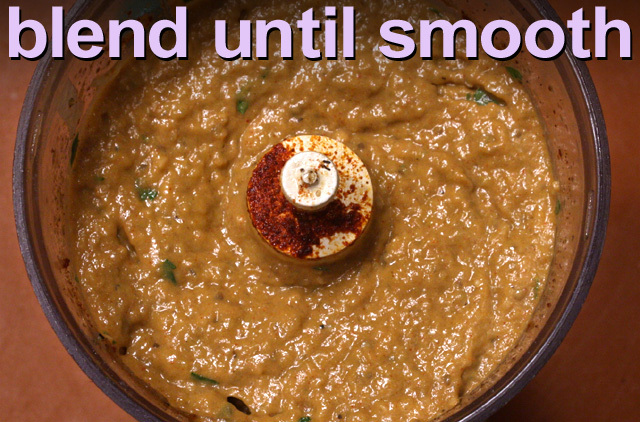 Baba Ganoush is finished with a quick spin in a blender or food processor. Serve it as a side -- or, cut pita bread into triangles and serve it as a dip at your next get-together. Baba Ganoush, like hummas, is made with Tahini: peanut butter-like, oily, ground sesame seeds. In my video that's what I used. But, I also show you how to make a taste-similar version of Tahini -- easily made by adding a couple of tablespoons of sesame seeds to your coffee grinder (or spice grinder) and blending until it's a powder (it doesn't grind every last seed, but does well enough.) 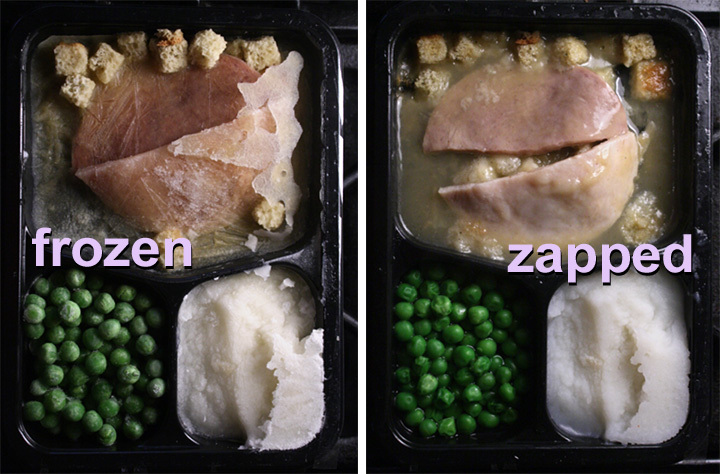 It's the same thing, really, just in a slightly damp powder form. It's the molecular gastronomic version a Top Chef would sprinkle over some deconstructed dish. If your local market doesn't stock Tahini, and you're not interested in grinding sesame seeds, then you can substitute with a teaspoon of peanut butter (just don't tell your Middle Eastern dining guests!) 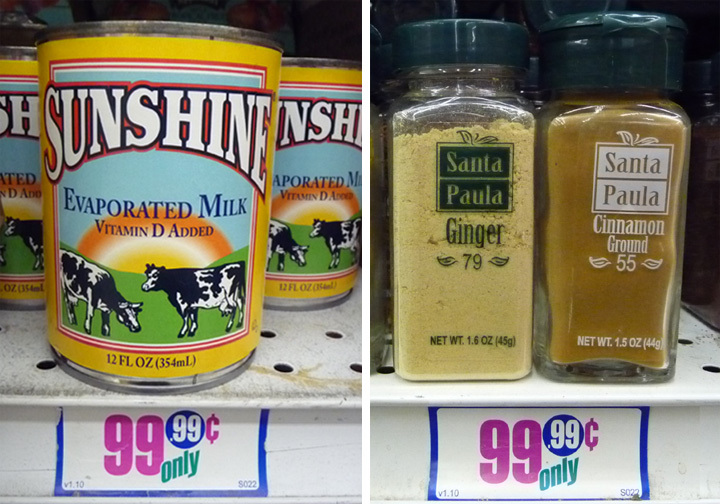 Peanut butter has a similar taste, but it's much stronger than Tahini, so you want to use half the amount. 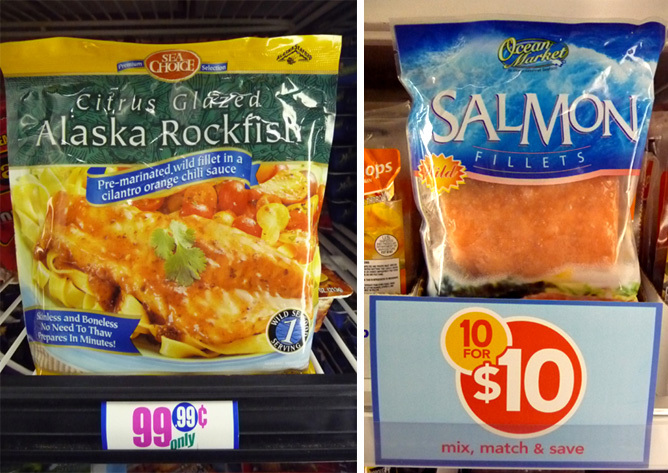 Or, for the easiest option of all, just use sesame oil. The taste is milder, but it will suffice. So pull up a chair and check out the 99 Cent Chef's latest recipe video, for Baba Ganoush. It's a fun, stop-motion animated delight of time-lapse deflating eggplants -- full of icky, gooey, veggie innards that blends into a smooth delicious dip. Play it here. Video runs 3 minutes, 3 seconds. 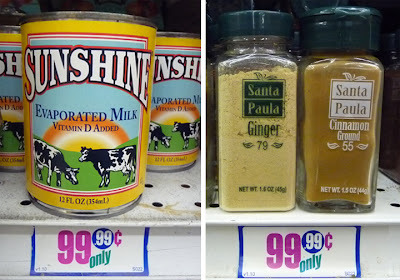 2 tablespoons Tahini - You can make your own by adding 2 tablespoons of sesame seeds to a coffee grinder, and pulverize. Or, just blend in a 2 tablespoons of sesame oil, instead of olive oil. You could even substitute Tahini with a teaspoon of peanut butter. 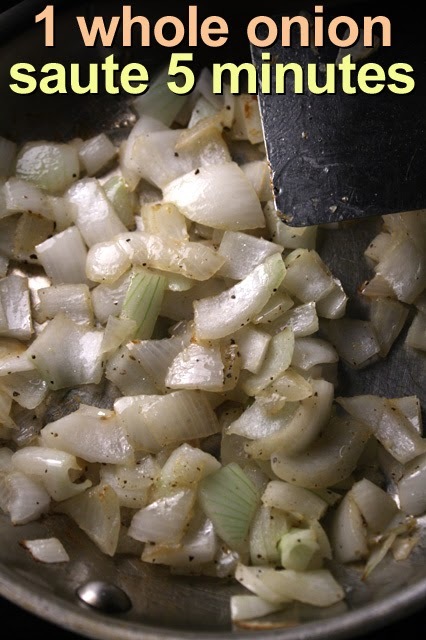 1 tablespoon of chopped garlic - fresh, or from jar. 2 tablespoons of lemon or lime juice - Fresh or from container. In the video I used lime juice. 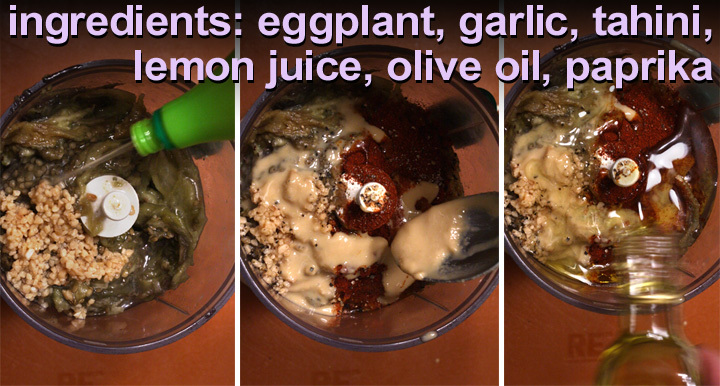 3 tablespoons of olive oil - 2 for blending, and 1 more for drizzling on Baba Ganoush before serving. Handful of parsley - or tablespoon of dried. 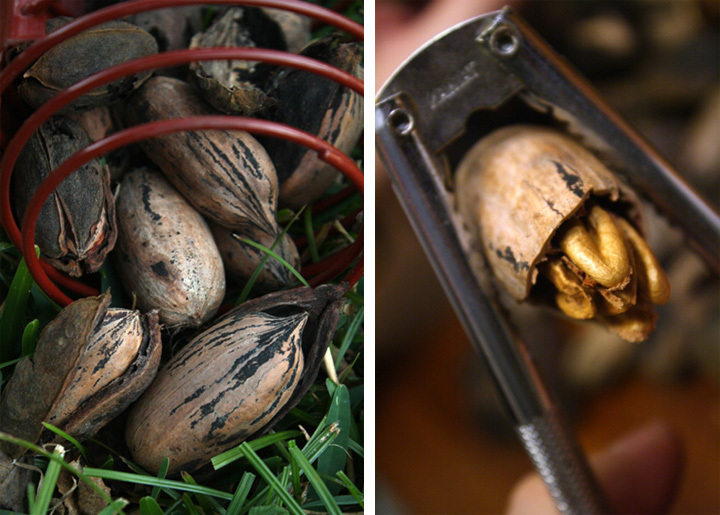 Save a chopped sprig for presentation. Optional. 1 teaspoon of paprika - optional. Slice into one side of the eggplant, or poke it all over with a fork -- you need to do this, or the eggplant may explode into a mess in your oven. 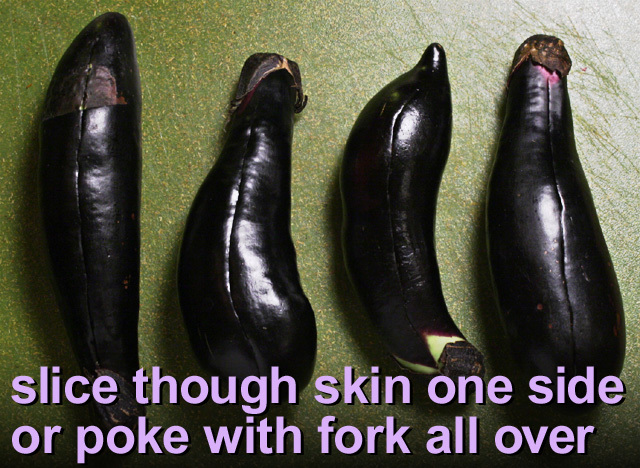 Cover eggplant in a casserole dish, or place in a large pan (or cookie sheet) and cover with foil. 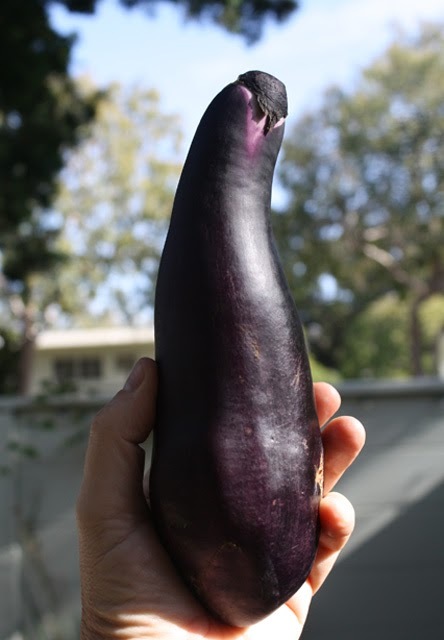 I used Japanese eggplant so this was easy to do - however if you are using a more typical large eggplant, poke it, then just wrap it in foil. Bake for 30 minutes at 400 degrees. 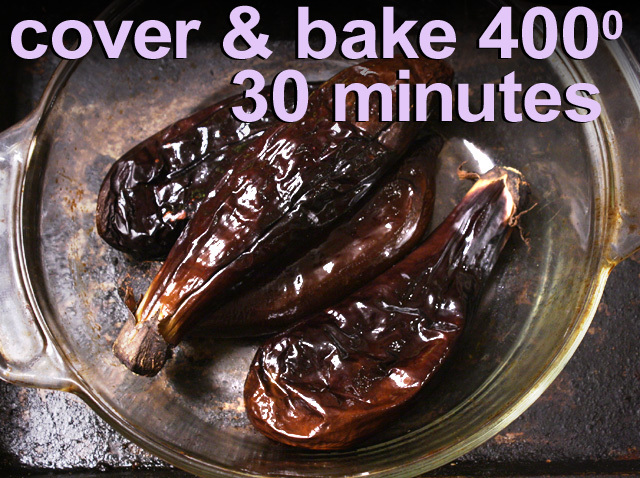 When eggplant is done, unwrap it and allow to cool for 10 minutes. It will continue to seam and soften in its skin. 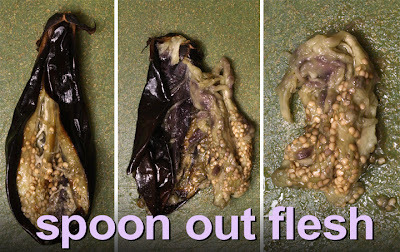 After it is cool enough to handle, split it open and spoon out the soft flesh into a bowl or plate. Toward the tapering stem, the meat may be stringy, but still usable -- it will mash and blend fine. 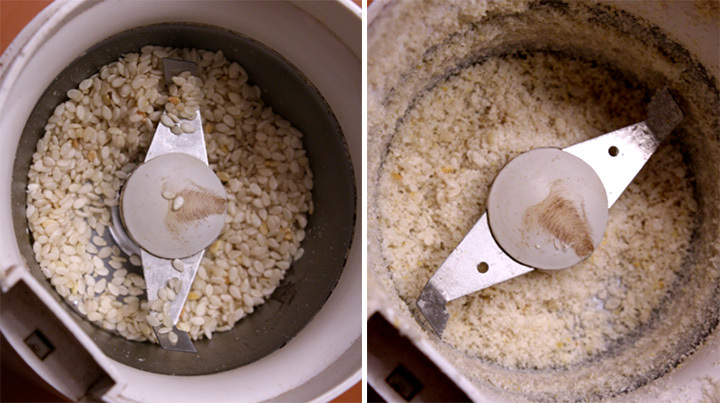 Finally, mix all the ingredients into a blender or food processor, and season with a dash of salt and pepper. 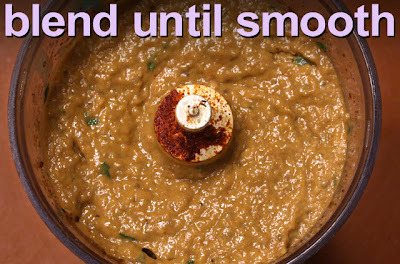 Pulse and blend until it is a smooth mass, similar to hummus or cooked grits. You could also just mash it all together with a fork, until the texture is like oatmeal. 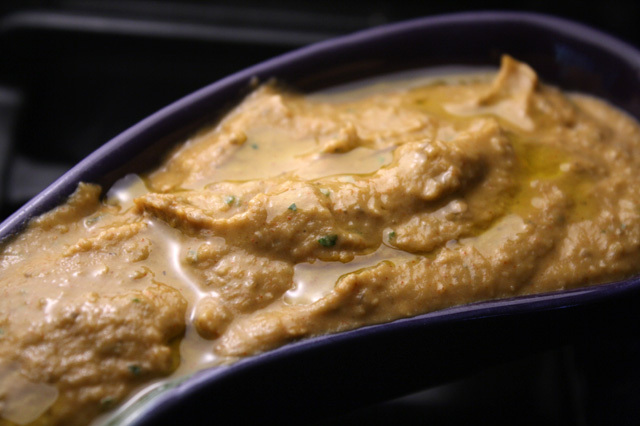 The flavors deepen and intensify if you let the Baba Ganoush sit covered in the refrigerator for a couple of hours; then set it out until it reaches room temperature. To serve, just spoon it into a serving bowl and sprinkle on some chopped parsley (optional) and finish with a light drizzle of olive oil. I like to cut up a pita into triangles, for easy scooping. For the carb-wary, substitute with some sliced veggie sticks like carrots, celery, broccoli, or any favorite crunchy veggie. 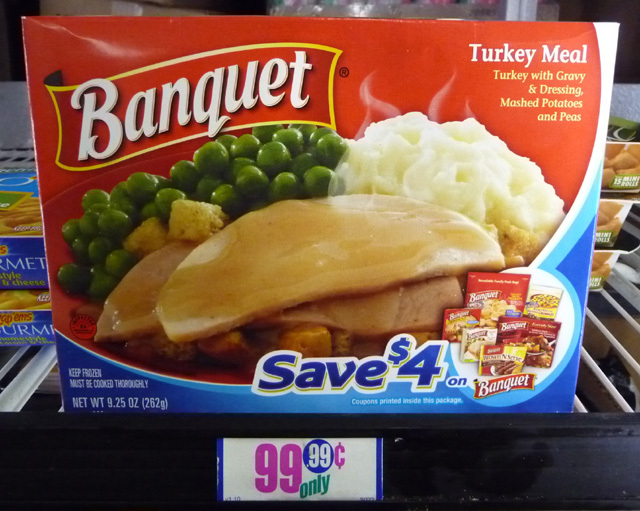 It's fine to just plop some on the plate and use it like a sweet gravy. As mentioned earlier, peanut butter is a convenient substitution -- just be sure to use half the amount asked for with Tahini. 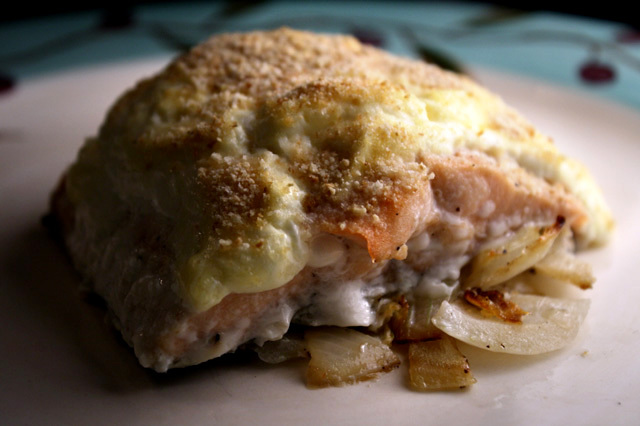 The next time I make it, I will try a version without the powdered paprika, or use even less. Usually when I get Baba Ganoush at a Persian or Israeli restaurant, they drizzle on olive oil, but you don't have to do this -- to keep things low calorie. I got a cup and a half of cooked flesh from the eggplant. Your amount may vary, but don't worry if you have less or more, just roll with it. Baba Ganoush is versatile enough to play around with adding and subtracting the ingredients -- that's what this chintzy chef does all the time, play in the kitchen!